Mold is a very sneaky organism that at first glance seems harmless enough, however it is actually very dangerous. It begins from a microscopic spore and it can cover the surface of an inside wall, crawl space, basement or attic in a matter of weeks. All it needs is a dark area, a source of moisture and no moving air in order to grow. It comes in several colors including green mold, yellow mold grey mold, black mold and a bluish mold. 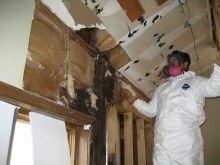 Black mold is considered to be the worst of the bunch and is more difficult to remove. Mold gives off spores which travel through the air and they can be breathed in and cause infections in the mouth, throat, esophagus and sinuses. It is also very unsightly and can cause great damage to merchandise and equipment in a business setting. The key to keeping mold growth down is moisture control, for where there is no moisture, there will be no mold. Any business that has dark areas in basements, storage areas, crawl spaces and similar areas should be inspected on a regular basis. If moisture is detected it can be tracked down and the source fixed so it doesn’t reoccur. If you discover mold anywhere in your business where it has grown to any sizable proportion, you should call a mold removal company to come and test it to see what kind it is. In this way they can determine how to treat it. Mold has roots, and it will not be eliminated by just “washing” it off because the roots will be left, and it will just regrow. The mold removal experts will be able to eradicate the growth of the mold and make sure that it doesn’t come back again to cause any further problems. Alpha Environmental inspects, tests, analyzes and offers solutions for hundreds of homes and businesses each year. These samples include mold, microbial particles, bacteria, and a variety of other allergy-causing particles indoors such as dust mites, cat and dog dander, and pest residue. Mold has long been linked to a variety of health effects in humans, including allergic reactions, asthma, runny nose, headaches, sneezing, upper respiratory complications, lack of energy, irritability, and even brain and other organ damage. The earliest known writings that discuss mold infestation are found in the Old Testament. Reality is that scientific research has not been conclusive to determine why and how inhalation of mold and other indoor allergens cause individuals, particularly those with compromised immune systems like infants and the elderly, to present the symptoms that many people do. We are not health-care professionals! But we do offer the scientific analyses that can assist your physician in properly dealing with your issues.